Our APRIL Wine Dinner is SOLD OUT! WOW! Thank you all so much for coming every month. You have spoken and we have listened. May will hold TWO WINE DINNERS! We hope you can make all of these!! If you have already made a reservation, THANK YOU. If not, HURRY! These dinners are selling out faster and faster! Looking forward to seeing everyone! We’ll post the menus as soon as they are available, i promise! Reservations still available!! Menu available from the 14th to the 17th! 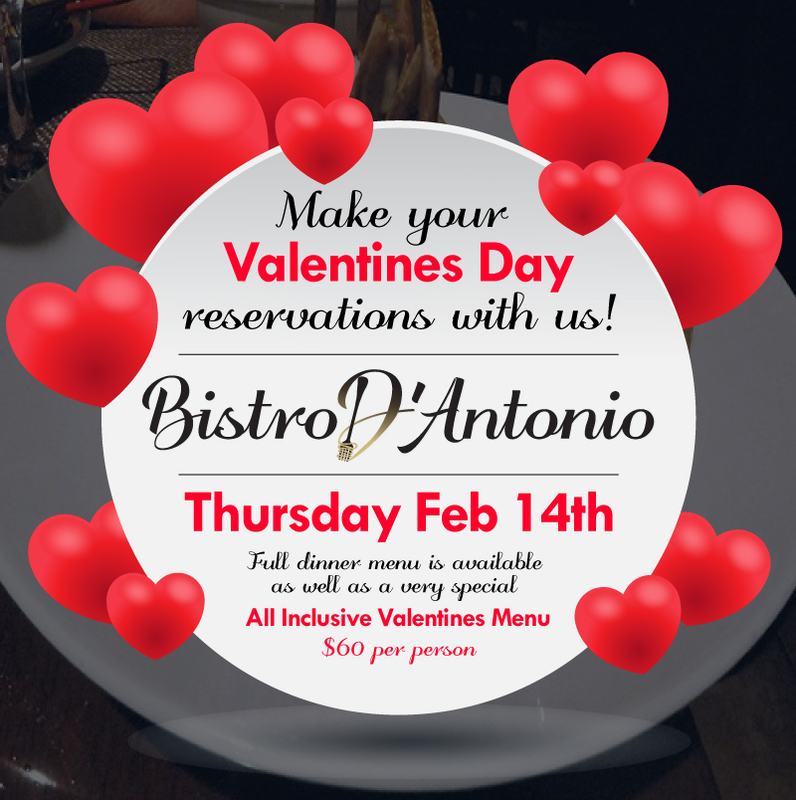 Treat your loved ones to a very special Valentines Day dinner! Join us Thursday the 14th. 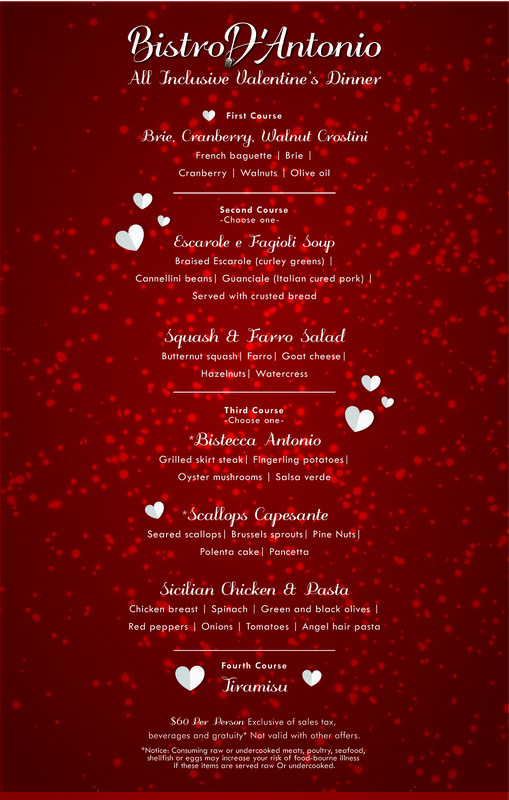 We will be serving our full menu as well as a special Valentines edition, All Inclusive Menu! (will be posted as soon as it's available!) 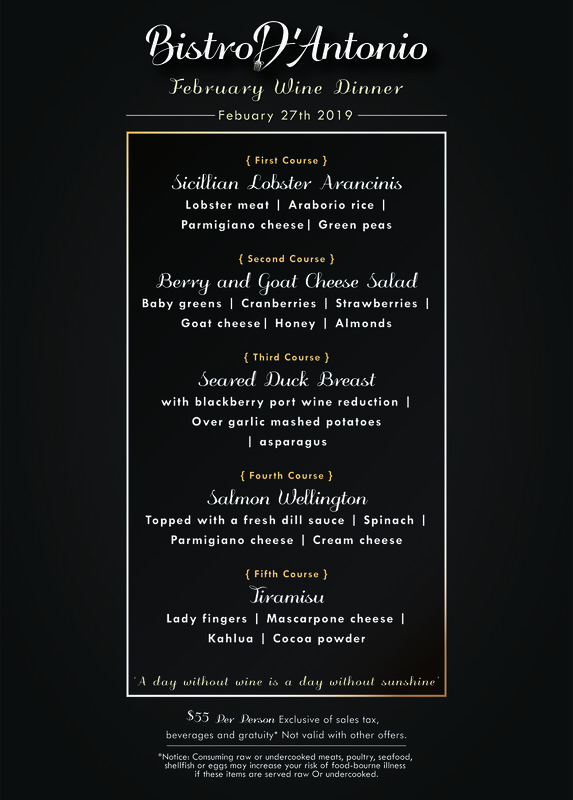 Our FOUR COURSE All Inclusive Valentines Dinner is $60 per person *not including drinks, tax or gratuity. This just might be my favorite dinner yet!! How good does this menu look! 😋 We still have some tables available!! Reserve yours today! Join us for this months Wine dinner! 5 Delicious courses crafted carefully, with wine pairings picked specifically for each dish! At the start of each course tasting notes and a brief history will be given by our friends from various vineyards. They will also be available for any questions you may have (or for some good conversation)! UPDATE: W'e’re all full. Join us for this months Wine dinner! 5 Delicious courses crafted carefully, with wine pairings picked specifically for each dish! At the start of each course tasting notes and a brief history will be given by our friends from various vineyards. They will also be available for any questions you may have (or for some good conversation)! Don’t rush around at the last min. trying to secure a reservation! Make yours today! Seating is very limited and we will fill up fast!!! Full dinner menu available as well as our very special All Inclusive Valentines Menu! Can’t wait to share this Valentines with the ones we love! OUR GUESTS! Now accepting reservation for our February Wine dinner. The last 2 dinners have sold out! We recommend getting your reservation as soon as you can confirm the date! We’ll post the menu as soon as it’s available! to everyone who have left those 5 star reviews!!!! You love us, you really love us!! This made our day! Thank you! What a great year it has been! Come celebrate with us and enjoy a very special All Inclusive New Years Dinner! $60 per person for 4 delicious courses! *Our regular dinner menu will also be available! We will be open from 4pm-10pm Call today to make your reservation!